My family are news junkies, and we usually have the radio news on when we are home in the afternoon. This past spring when an article on Residential Schools came on, my curious children (9 and 6 years old) asked what that meant. 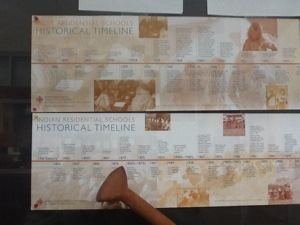 We explained that from the 1870s until the later part of the 20th Century, many First Nations children were required by law to leave their families and attend boarding school. There they were not allowed to speak the language that they grew up with. My children had trouble understanding this, so I asked them to imagine our family in this situation, to imagine a situation where our country had been invaded, to imagine that they had to attend school far away from us, and were not allowed to speak English to each other at all. That they could be punished for speaking the language they knew best. At this point my children became very upset, and asked me to stop talking about it. The idea of being taken from their family, and being unable to communicate, or to be themselves, was highly distressing. They could feel how awful this would be, and as parents, we could feel how awful it would be to have our children taken from us, to have no choice in the matter, and to have no control or influence over what they learned and how they were treated at school. My children are young, and so we didn’t even talk about some of the more terrible things that happened to children at the residential schools, the poor conditions, illness and abuse. But at the same age many Aboriginal children experienced these issues personally. There are many aspects of being Canadian that I am proud of: our strong international reputation as peacekeepers, our fantastic hockey players (male and female); the amazing Vancouver Olympics. Even though I take pride in these accomplishments, I didn’t have anything to do with making them happen. In the same way, I feel ashamed that Canadians made the decisions that led to the residential schools. As Canadians, and as educators, we have the responsibility to recognize, and to help our students understand, this ugly part of our past. To ignore it is to make it harder for those in our community who were affected by it. As we tell the truth about what happened, we can help ourselves and our Aboriginal citizens to make peace with this awful piece of Canadian history.